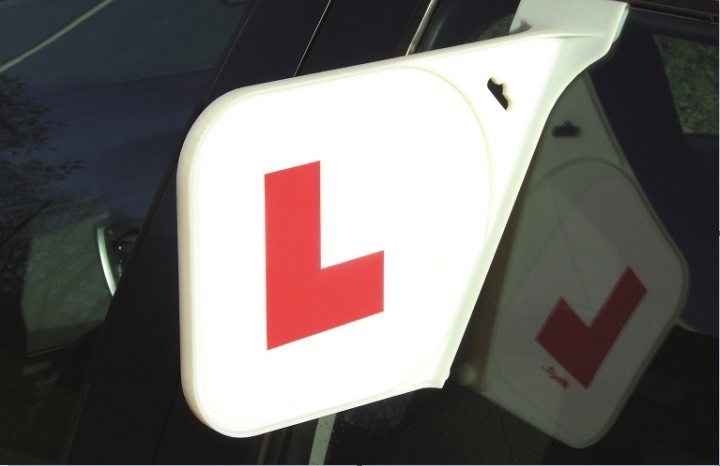 A new alternative to traditional ‘L’ and ‘P’ plates has been launched to provide learner and newly qualified drivers with extra confidence they will be given due consideration by other road users. The ‘Insight Vehicle Sign System’ has been developed by Euro Road Safety (ERS), who say that when new regulations allowing learner drivers on motorways come into effect in June, it will be even more important for learners to stay visible on the road. The ‘unique’ shape of the new sign means it will appear at an ‘easy-to-see 90-degree angle’ to the car door and will not impair the driver’s rear view. The sign is designed to be visible up to 50 metres in front or behind the vehicle. The system fits securely over the glass of the passenger window (driver side) and can be easily removed when the driver parks. Unlike magnetic ‘L’ plates, it will not be dislodged while driving and is easier to remove than self-adhesive plates. Phil Thorpe, who invented the product, said: “If ‘L’ plates fall off while the car is being driven, it leaves the learner at risk of accidents because other drivers will not anticipate quick braking or slower manoeuvres. Reflective L plates would be legal if the front one had a reflective white background and non reflective L with the rear one vice versa. Whilst I agree ‘J’ my concern was mainly to the rear of the machine and that its very easy to miss that small red light to the rear of many modern motorcycles. Many commuters ride at times in the dark for more than 6 months of the year and also in dark overcast weather. I still think that it is worth pursuing as regs can be changed but from a safety aspect that drivers would recognise a learner better whether its approaching on the other side of the road or if at a junction or roundabout approaching them from their right. Its not only that recognition but actually seeing that there is a motorcycle/scooter present on the road that will make things safer. There is no reason why a rear reflective L plate could not be used on the back as the law allows and requires the showing of such and many L plates actually are placed over that reflective material hiding it from view. From a road safety perspective I believe it to be a viable suggestion and worthy of further consideration. The reflective L plate was probably dismissed as it falls outside of vehicle lighting regulations. It is an offence to show a red light (including retro-reflective red light) to the front of a vehicle. Putting a reflective L plate on the front of a vehicle either unwittingly or on purpose would constitute an offence. O dear me! If other traffic respected learner drivers then of course this would be an improvement. However, for most drivers it’s like a red rag to a bull so more drivers will now be aware of the learner vehicle which means more disrespect! I presume this should only be fitted to cars with four doors? How about a vehicle with automatic rear windows – it’s awful easy to accidentally hit the wrong button when you’re needing a blast of fresh air!! I recently communicated with the DfT about the possibility and the advantage of an ‘L’ plate that would be reflective in poor daylight conditions and at night where lights would be on. This would be of benefit for more than 6 months of the year when its dark early mornings and early evenings when vulnerable motorcyclists in particular lack good visibility particularly to the rear of the vehicle having a poor red light being possibly the only illumination . The issue of a reflective red on white plate the size it presently is would assist commuters and also delivery riders to be seen better. I further informed them of my concerns with regards to the disfigurement of many L plates when they are reduced in size etc to make them fit onto a bikes structure. Some of them just use the red ‘L’ and it makes them impossible to be seen. I suggested that the sales literature on packaging had warnings be given as to the offence of any alteration to the L plate at the place of sale. The DfT basically dismissed both these suggestions. My opinion is that qualified drivers need to be educated first on using the motorway safely, before allowing learner drivers on them. L plates are not going to make any difference on the tuition vehicles. Many drivers fail to see the blue lights of emergency vehicles now, and they don’t keep safe distances! Some ADIS would not be safe doing motorway training anyway. Is this a solution looking for a problem? Learners already go on 70mph dual roads and what evidence is there to suggest that the actual L plates used are not suitable now?